Newberry City Hall is located at 1330 College Street, Newberry, SC 29108; phone: 803-321-1000. Photo: Coateswood, ca. 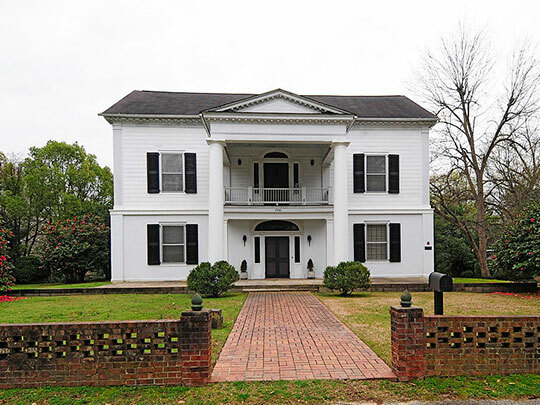 1841, 1700 Boundary Street, Newberry, SC. Listed on the National Register of Historic Places in 1975. Photographed by User: Bill Fitzpatrick (own work), 2012, [cc-by-3.0 (creativecommons.org/licenses/by/3.0)], via Wikimedia Commons, accessed August, 2014. Newberry County was formally established in 1785, upon the division of the Ninety Six District into Edgefield, Abbeville, Laurens, Spartanburg, Union and Newberry Counties. The village of Newberry was formally established as the county seat in 1789. Both the commercial and political life of the village was controlled by a small contingent of professionals and merchants. The introduction of the cotton gin in the late eighteenth century transformed the County into a leading pre-war cotton market. By the 1820s, large scale cotton farming replaced the smaller subsistence farms that had characterized the region. With its new economic position, Newberry quickly attracted a number of doctors, lawyers, and other professionals. The village of Newberry boasted a courthouse, jail, school, burial ground, postmaster and library society. However, the village had no church for the first 40 years of its existence. Although several Lutheran churches and one Baptist church had been organized in Newberry County since as early as 1754, the first church in the village of Newberry was not incorporated until 1831 by the Baptists. In 1832, Newberry citizens petitioned the General Assembly for incorporation as a town. Two decades later, Newberry secured the first upstate railroad line in 1851, followed by the Laurens railroad in 1854. The Town experienced a great deal of growth during the latter half of the nineteenth century because of its key position as the State's leading inland cotton market, the extension of the railroad, and the relocation of Newberry College in 1855.